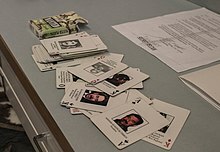 During the 2003 invasion of Iraq by a United States-led coalition, the U.S. military developed a set of playing cards to help troops identify the most-wanted members of President Saddam Hussein's government, mostly high-ranking members of the Iraqi Regional Branch of the Arab Socialist Ba'ath Party or members of the Revolutionary Command Council. The cards were officially named the "personality identification playing cards". As of 2018, all but 6 of the 52 most wanted have been either killed, or captured. The list of "Most Wanted" was the result of a multi-intelligence agency collaboration which included the Defense Intelligence Agency, Central Command, and representatives from all US Service Branch Intelligence entities. The "Most Wanted" names were then assigned to their respective cards by five US Army soldiers, 2LT Hans Mumm, SSG Shawn Mahoney, SGT Andrei Salter, SGT Scott Boehmler, and SPC Joseph Barrios, who were assigned to the Defense Intelligence Agency. The pictures used on the cards came from a number of intelligence agencies, but most were derived from "open sources". The deck of cards was first announced publicly in Iraq on 11 April 2003, in a press conference by Army Brig. Gen. Vincent Brooks, deputy director of operations at U.S. Central Command. On that same evening Max Hodges, a Houston-based entrepreneur, found and downloaded a high-resolution artwork file for the deck from a Defense Department web server. Discovering the following day that the file had vanished from the military web server he became the first eBay seller to offer the artwork file, in PDF, which could be used to reproduce the deck. He quickly contracted Gemaco Playing Card Company to print 1,000 decks for about $4,000 and started selling both the decks, in advance of receiving them from the printer, on eBay, Amazon.com and his own web site. When some of his early auctions for a $4 deck of cards quickly rose to over $120, it did not take long for other eBayers to jump on the bandwagon and print or order decks of their own to sell. In just a few days hundreds of sellers materialized and the price dropped to just a few dollars per deck. Texas-based Liberty Playing Card Co. received an order to manufacture the cards for the U.S. Embassy in Kuwait and by claiming to be "the authorized government contractor" quickly became another popular domestic supplier for the commercial market. The U.S. military inadvertently included in the jokers the trademarked Hoyle joker owned by the United States Playing Card Company of Cincinnati, Ohio. Although The U.S. Playing Card company does not object to the government's use of the image, they do object to other companies using the trademarked image. Thus, in some sense, the U.S. military inadvertently granted The U.S. Playing Card Company exclusive rights to manufacture the authentic decks, if the trademarked images on the jokers are considered a requirement for being authentic. Ace ♠: Saddam Husayn Al-Tikriti, President (#1 on most-wanted list) (Captured 13 December 2003) (Executed 30 December 2006). King ♠: Ali Hasan al-Majid, Presidential Advisor/RCC Member, also known as Chemical Ali (#5) (Captured 21 August 2003) (Executed 25 January 2010). Queen ♠: Muhammad Hamza Zubaydi, Retired RCC member (#9, but was originally #18) (Captured 21 April 2003) (Died in Custody 2 December 2005). Jack ♠: Ibrahim Ahmad Abd al-Sattar Muhammad, Iraqi Armed Forces Chief of Staff (#13, was #11) (Captured 12 May 2003) (Died in Custody 28 October 2010). Ten ♠: Hamid Raja Shalah, Air Force Commander (#17, was #15) (Captured 14 June 2003)(Released August 2007). Nine ♠: Rukan Razuki Abd al-Ghafar, Head of Tribal Affairs Office (#21, was #39) (Killed in 2003). Eight ♠: Tariq Aziz, deputy prime minister (#25, was #43) (Surrendered 24 April 2003 and sentenced to death, Died in June 2015). Seven ♠: Mahmud Dhiyab, minister of interior (#29, was #46) (Surrendered 2003, Released in July 2012). Six ♠: Amir Rashid Muhammad al-Ubaydi, presidential adviser/former oil minister (#33, was #47) (Surrendered 28 April 2003, Released in April 2012). Five ♠: Watban Ibrahim Hasan, presidential adviser (#37, was #51) (Captured 13 April 2003 and sentenced to death. Died of natural causes in custody on 13 August 2015). Four ♠: Muhammad Zimam Abd al-Razzaq, Ba'ath Party branch command chairman (#41, was #23), (Captured 15 February 2004). Three ♠: Sa'd Abdul-Majid Al-Faisal, Ba'ath Party branch command chairman (#55, was #36), (Captured 24 May 2003) (Released 18 December 2005). 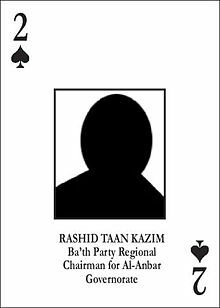 Two ♠: Rashid Taan Kazim, Ba'ath Party regional chairman (#49, was #30), (Captured 9 July 2006), or possibly still fugitive. Ace ♣: Qusay Saddam Husayn, son of Saddam (#2), killed in standoff with the U.S. Army in Mosul, Iraq 2003. King ♣: Izzat Ibrahim al-Douri, RCC vice chairman (#6). Queen ♣: Kamal Mustafa Abdallah Sultan, secretary of the Republican Guard (#10, was #8), (Surrendered 17 May 2003). Jack ♣: Sayf Al-Din Fulayyih Hasan Taha Al-Rawi, Republican Guard chief of staff (#14, was #12). Surrendered May 2003. Ten ♣: Latif Nusayyif Jasim, Ba'ath Party military bureau deputy chairman (#18, was #37), (Captured 9 June 2003). 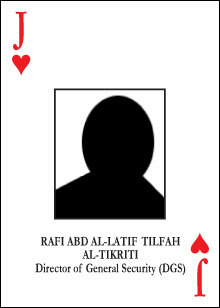 Nine ♣: Jamal Mustafa Abdallah Sultan, deputy head of tribal affairs (#22, was #40), (Surrendered 20 April 2003). Eight ♣: Walid Hamid Tawfiq, governor of Basra (#26, was #44), (Surrendered 29 April 2003). Seven ♣: Ayad Futayyih Khalifa al-Rawi, Quds forces chief of staff (#30, was #20), (Captured 4 June 2003) (Died in Custody 18 May 2018). Six ♣: Husam Muhammad Amin, head of National Monitoring Directorate (#34, was #49), (Captured 27 April 2003) (Released 2005). Five ♣: Barzan Ibrahim Hasan, presidential adviser (#38, was #52), (Captured 17 April 2003) (Executed 2007). Four ♣: Samir Abd Al-Aziz, Ba'ath Party branch command chairman (#42, was #24), (Captured 17 April 2003). Three ♣: Sayf al-Din Al-Mashhadani, Ba'ath Party branch command chairman (#46, was #27), (Captured 24 May 2003). Two ♣: Ugla Abid Saqr, Ba'ath Party regional chairman (#50, was #31), (Captured 20 May 2003). Ace ♥: Uday Saddam Husayn, son of Saddam Hussein, killed in standoff with US Army in Mosul, Iraq 2003 (#3). King ♥: Hani Abd al-Latif Tilfah, Director—special security organization (#7). Queen ♥: Barzan Abd al-Ghafur Sulayman Majid, Special Republican Guard commander (#11, was #9), (Captured 23 July 2003). Jack ♥: Rafi Abd Al-Latif Tilfah, director of general security (#15, was #13). Ten ♥: Abd Al-Tawab Mullah Huwaysh, deputy prime minister (#19, was #16), (Captured 2 May 2003). Nine ♥: Mizban Khadr Hadi, RCC member (#23, was #41), (Surrendered 9 July 2003). Eight ♥: Sultan Hashim Ahmad, minister of defense (#27, was #19) (Captured 2003, Sentenced to Death). Seven ♥: Zuhayr Talib Abd Al-Sattar, director of military intelligence (#31, was #21), (Captured 23 April 2003). Six ♥: Muhammad Mahdi (#35, was #48), (Captured 23 April 2003). Five ♥: Huda Salih Mahdi Ammash, weapons of mass destruction scientist (known as "Mrs. Anthrax"; No. 39, was #53; also the only female on the entire list), (Captured 7 May 2003), (Released 2005). Four ♥: Humam Abd Al-Khaliq Abd, minister of higher education and scientific research (#43, was #54), (Captured 19 April 2003). Three ♥: Fadil Mahmud Gharib, Ba'ath Party branch command chairman (#47, was #28), (Captured 15 May 2003). Two ♥: Ghazi Hammud, Ba'ath Party branch command chairman (#51, was #32), (Captured 7 May 2003). Ace ♦: Abid Hamid Mahmud, presidential secretary (#4), executed on 7 June 2012. King ♦: Aziz Salih, Ba'ath Party branch command chairman (#8, was #17, sentenced to death in 2011). Queen ♦: Muzahim Sa'b Hassan al-Tikriti, air defense forces commander (#12, was #10) (Captured 23 April 2003, Released in April 2012). Jack ♦: Tahir Jalil Habbush, Iraqi intelligence service (#16, was #14). Ten ♦: Taha Yasin Ramadan, vice president/RCC member (executed in 2007; #20, was #38). Nine ♦: Taha Muhyi Al-Din Maruf, vice president/RCC member (#24, was #42), (Captured 2 May 2003), (died in exile in 2009). Eight ♦: Hikmat Mizban Ibrahim, deputy prime minister and finance minister (#28, was No. 45), (Captured 18 April 2003), (Died in Custody 2012). Seven ♦: Amir Hamudi Hasan, presidential scientific adviser (#32, was #55), (Surrendered 12 April 2003). Six ♦: Sabawi Ibrahim Hasan, presidential adviser (#36, was #50- Died of cancer in 2013). Five ♦: Abd al-Baqi Abd al-Karim Abdallah, Ba'ath Party branch command chairman (#40, was #22 - Captured in 2015). Four ♦: Yahya Abdallah, Ba'ath Party branch command chairman (#44, was #25), (Killed in 2003). Three ♦: Muhsin Khadr, Ba'ath Party branch command chairman (#48, was #29), (Captured 7 February 2004). Two ♦: Adil Abdallah Mahdi, Ba'ath Party branch command chairman (#52, was #33), (Captured 15 May 2003). There are also two jokers: one lists Arab titles, the other Iraqi military ranks. There are no cards for most-wanted No. 45 (was #26), Nayif Shindakh Thamir, No. 53 (was #34 – Killed in 2003 or probably still fugitive) Husayn al-Awadi, or No. 54 (was #35) Khamis Sirhan al-Muhammad, captured on 11 January 2004. Al-Muhammad was held for six years before being released on 30 July 2010. He has since fled to Syria where most of the other 6 uncaptured members of the deck of cards are reported to be hiding. Mercenaries (video game) – used a similar playing card scheme for enemy leaders. Wikimedia Commons has media related to Most-wanted Iraqi playing cards. ^ Burgess, Lisa (17 April 2003). "Buyers beware: The real Iraq 'most wanted' cards are still awaiting distribution". Stars and Stripes. Retrieved 17 February 2017. ^ "The Faces Behind the Faces on the 'Most Wanted' Deck". Armed Forces Press Service. ^ Valdes-Dapena, Peter (13 April 2003). "Hot item: 'Most wanted Iraqi' cards". CNN. Retrieved 13 May 2010. ^ Jane Sutton (17 August 2007). "As last Iraqi POW released, Noriega only U.S. POW". Reuters. Retrieved 26 February 2019. ^ "صدام حسين من الزنزانة الامريكية : هذا ماحدث". Dhiqar.net. Retrieved 30 August 2013. ^ "Iraq Frees Saddam Hussein's Interior Minister". Aina.org. Retrieved 30 August 2013. ^ Mamoun, Abdelhak. "Watban Ibrahim al-Hassan, half brother of Saddam Hussein, has died - Iraqi News". Iraq news, the latest Iraq news by Iraqi News. Retrieved 18 February 2016. ^ a b c d e f g h i j k l m n o "أبرز وجوه النظام العراقي السابق: أين هم الآن؟". BBC (in Arabic). 2 September 2010. ^ "اعتقال الرجل الثاني في الجيش الإسلامي و رشيد كاظم طعان". Buratha News Agency (in Arabic). 10 July 2006. ^ "Iraq executes Saddam Hussein's aide Abid Hamid Mahmud". BBC News. 7 June 2012. Retrieved 7 June 2012. ^ DAVID JOHNSTON and JAMES RISENPublished: 19 April 2003 (19 April 2003). "A NATION AT WAR: THE HUNT; New Tape of Hussein Prolongs Debate on His Fate - New York Times". Nytimes.com. Retrieved 30 August 2013. ^ Published: 25 March 2003 (25 March 2003). "A NATION AT WAR: THE IRAQI CAPITAL; HUSSEIN RALLIES IRAQI DEFENDERS TO HOLD CAPITAL - Page 2 - New York Times". Nytimes.com. Retrieved 30 August 2013. ^ Mohammed, Riyadh, "Hussein Backer Set Free In Iraq", Los Angeles Times, 5 August 2010, p. 10. Brigadier General Vincent Brooks introduces Iraqi cards at CentComm press conference in Doha, Qatar, 11 April 2003. "Troops Dealt an Old Tool" by Tom Zucco, St. Petersburg Times, 12 April 2003. "Card-Carrying Civilians", Time Magazine, 12 May 2003, page 25. Card Makers Producing 'Most-Wanted' Decks: Company Warns Others About 'Joker' Image, 23 April 2003, ClickOnDetroit.com.